The BACnet community is proud to announce that Setra has become the latest company to join BACnet International as a Silver member. Setra, founded in 1967, designs and develops one of the most comprehensive portfolios of sensors in the world. It has nearly 50 years of experience in critical applications in many industries, and is part of the Fortive Corporation, a Fortune 500 science and technology leader. Setra joins more than 125 of the leading building automation vendors and integrators in the world advocating BACnet as a communication protocol. BACnet International is an industry association that facilitates the successful use of the BACnet protocol in building automation and control systems through interoperability testing, educational programs and promotional activities. BACnet International oversees operation of the BACnet Testing Laboratories (BTL) and maintains a global listing of tested products. 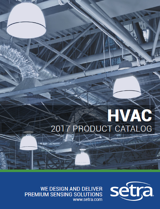 The BACnet standard was developed by the American Society of Heating, Refrigerating and Air-Conditioning Engineers (ASHRAE) and has been made publicly available so that manufacturers can create interoperable systems of products. BACnet International complements the work of the ASHRAE standards committee and BACnet-related interest groups around the world. BACnet International members include building owners, consulting engineers and facility managers, as well as companies involved in the design, manufacture, installation, commission and maintenance of control equipment that uses BACnet for communication. For more information, please visit www.bacnetinternational.org.